Loyalty points and miles can be incredibly rewarding, but it’s important to make sure that the cost of earning them doesn’t wipe away the value you get from redeeming. Today, TPG Senior Points & Miles Correspondent Jason Steele looks at how you can avoid some of the more insidious charges associated with travel rewards credit cards. While most travel rewards enthusiasts love the perks and benefits of their credit cards, there are still a lot of skeptics. Credit card terms can be terribly unforgiving when you make a late payment or pay slightly less than the entire statement balance. In those cases, you can be charged for a late fee, as well as for interest charges on all your purchases from the date of transaction. So today, I want to look a bit more closely at how credit cards work, and what happens when you mistakenly make a late payment, or one that is just short. Then, I’ll show you a few steps to control the damage and prevent it from happening again. Anyone who uses rewards credit cards should be avoiding interest by paying each month’s statement balance in full and on time. When you do that, it’s easy to think of your credit card as a short-term, interest free loan, which it effectively is in this case. However, the reality is that you are always incurring interest charges on your credit card, and those charges are waived if and only if the entire statement balance is paid in full before the due date. The period between your statement closing date and your payment due date (typically 21 or 25 days), is called the grace period. Even something as simple as a typo can initiate interest charges, but there are ways to mitigate such mistakes. Image courtesy of Shutterstock. If you’re like me, then you use your credit card as your primary method of payment in order to earn as many travel rewards as possible. And if you travel frequently or have many other expenses, its easy to have thousands of dollars worth of charges on your statement balance. Remember, each charge is incurring interest from the date of purchase until the date of payment, which is only waived by making an on-time payment in full. So let’s say you charged $5,896 one month, but accidentally made a payment of $5,869, which is just a typo when specifying an electronic payment. Paying just $27 short will mean that you will owe interest on the entire $5,896 based on the average daily balance of your account from the beginning of your statement period until when your payment was received, which can be as long as 55 days and still be on-time. Even then, you will have lost your grace period, meaning that you’ll incur interest charges on all your purchases during your next statement period, (as well as the $27 you were short from the original statement period). With interest rates on rewards credit cards commonly running between 15%-20% APR, the interest charges can easily exceed the amount of the short payment. So in the example above, interest charges could be in the $50-$100 range (depending on the interest rate and how early the charges were made), even though the payment was only $27 less than necessary to waive all interest charges. When this happens, it feels like you’re being charged an interest rate that is over 3000% APR, since you’ve incurred interest charges in one month that are three times the amount of your shortfall! Other similar mistakes (like entering in the wrong date) may cause you to incur interest charges in the same way, as well as costly late fees. Pay your credit card bills on time, but have a backup plan in case something goes wrong. Image courtesy of Shutterstock. However careful you are, these credit card payment mistakes will eventually happen to all of us, but there are ways to mitigate the damage. Keeping in mind how fiercely the credit card industry competes to attract and retain its customers, card issuers are usually inclined to waive late fees and interest charges when customers miss their payment dates. When this happens to me, I like to call the card issuer as soon as I realize my error, but only after I’ve issued payment for any remaining balance on the card. Once I’m speaking with a representative, I prefer to admit up front that I made a mistake, and ask directly to have all late fees and interest charges waived. I have never had such a request turned down; in fact, representatives usually offer to waive charges before I even ask. Look at this situation from the card issuer’s standpoint: they likely spend hundreds of dollars in marketing, advertising, and sign-up bonuses to attract each new customer; it would be foolish to risk losing an existing customer over a relatively small amount. So if you regularly make on-time payments and your account is in good standing, receiving a one-time waiver of late fees or interest charges is nearly a sure thing. Once you’ve cleaned up your mess, it’s time to go about taking steps to avoid facing the same problem again. The easiest way to prevent these kind of shortfalls is by setting up automatic payments from your card issuer. For example, Chase cards can be set to make automatic payments for either the minimum amount due, or the full amount. 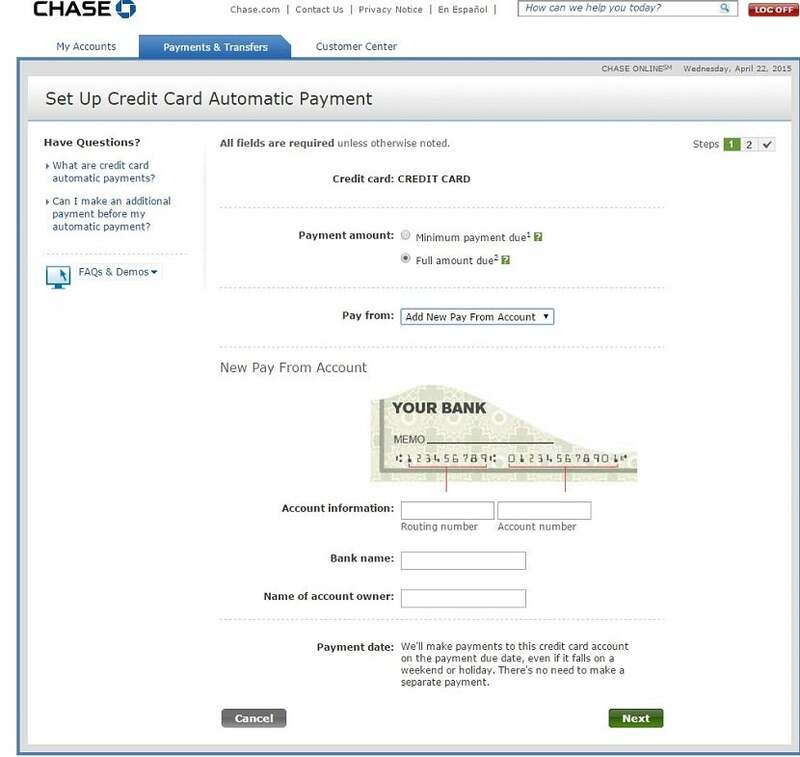 Setting up an automatic card payment through Chase. While it’s never a good idea to pay just the minimum amount, this option can be a fail-safe way to avoid ever being charged a late fee should you forget to make a payment. Better yet, just choose to pay the full amount due automatically to avoid incurring interest as well. In addition, most credit card issuers offer their own automatic systems to alert cardholders, but with much less functionality. One of the advantages of the TPG To Go app is that you can manage all of your alerts from all of your credit cards in one place, and it will remind you of bonus offers and category enrollments that the card issuer’s system likely will not. Credit cards are a great way to earn valuable perks and travel rewards, but only when we remember to pay our bills in full and on time. When mistakes do occur, it’s nice to know that you may be able to avoid the costly repercussions, and there are steps you can take to keep you out of trouble in the future.